Somehow, I managed to live the first 25-26 years of my life before trying spaghetti squash. Actually, I could add many, many foods to that list. 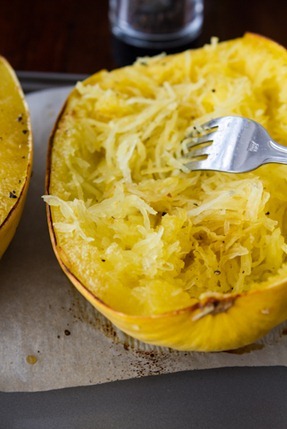 When I first came across spaghetti squash, I didn’t quite know what to think of it. Stringy strands of squash? How the heck do I get that to work? It seems weird. Naturally, this only made me want to try it more! Well, it is a bit weird when you think about it, but it’s also now one of my favourite foods. I could add many things to that list too. 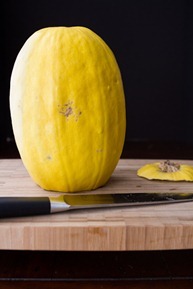 This big squash (photographed) hails from Aylmer, Ontario – a hefty 5 pounder! 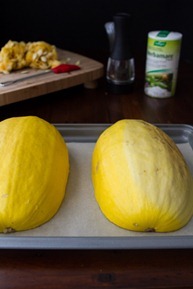 If you’ve ever been intimidated by preparing and roasting a spaghetti squash like I have, I hope these step-by-step photos are helpful. Note: If you really, really don’t want to slice the squash in half, rest assured you can roast squash whole (just pierce it with a few knife cuts first). 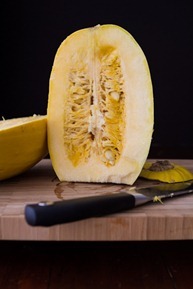 I prefer to slice it in half for a couple reasons: 1) I season the squash before roasting and the flavour infuses as it roasts, and 2) It cooks in a fraction of the time – often ~20 minutes faster compared to roasting it whole. However, roasting it whole is a nice option if you have a really big squash and a dull knife! 1. Preheat the oven to 375F. 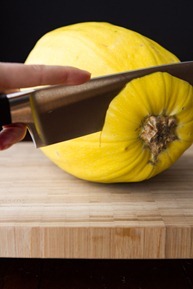 If your squash is quite large, start by slicing off the stem. This makes it easier to slice through and also gives you a flat base to work with. You can do this on a cutting board or an old tea towel. 2. Place squash flat end down. With a [recently sharpened] chef’s knife, slice down the middle lengthwise. I like to use a “rocking” motion to cut through. This big squash was challenging, but a slow and steady pace eventually won the race…or something like that. 3. With a metal ice cream scoop (my Zyliss scoop works amazing for this!) or spoon, scoop out the seeds & guts. Set aside seeds if you plan to roast them later. And you will, right? 4. Brush halves with a tiny amount of olive oil (I used maybe 1/2 tsp oil on each). Sprinkle with Herbamare (or sea salt) and freshly ground black pepper. Place on a baking sheet lined with parchment paper, cut side down. The salt & pepper you just sprinkled on will stick to the oil. 5. Roast at 375F for around 35-45 minutes, or until you can easily scrape strands away from the squash. The outer yellow skin will also deepen in colour. Baking time will vary depending on the size. My 5-pound squash took 40 minutes. 6. Remove from oven and flip each half. At this point, feel free to use the fork to see if the strands easily come off. If it’s ready, cool for about 5-10 minutes and then grab the fork and scrape the squash flesh over and over. You’ll be left with a bunch of spaghetti-like strands! Season again and serve immediately – in the shell if you wish. My 5 pound squash made just over 4 cups of “spaghetti” strands – the perfect amount for Eric and I to share. Something as simple as salt, pepper, marinara, dried basil, and garlic powder is a fantastic combo. I could eat this every. single. day. I also love to serve homemade chili or stew on top. Or in this case, creamy avocado sauce. For this recipe, I played around with my creamy avocado pasta sauce. It was so good I had to share the results. To email, print, or text this recipe, click here. 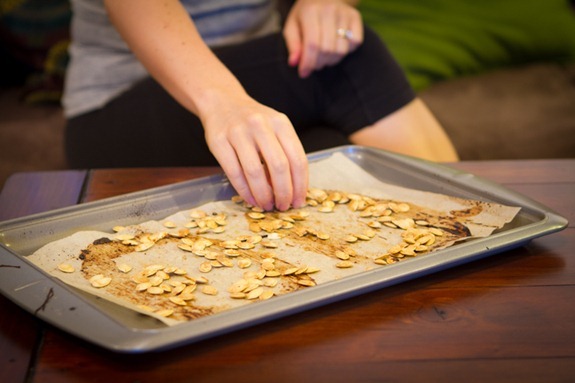 We enjoyed the roasted squash seeds while watching some great fall tv! Anyone catch The Mindy Project this week? I’m pretty much obsessed with it after 1 show. Also, glad to have Up All Night back on – another show I never miss. To my surprise, the seeds taste just like sugar pumpkin seeds. yum! 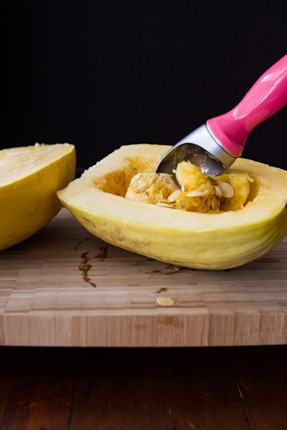 What’s your favourite way to enjoy spaghetti squash? What are your must-see fall tv shows? We love spaghetti squash topped with roasted veggies (mushrooms, red peppers, onions, zucchini, etc.) and a pesto like the recipe you have for pesto made with beans – over the top in flavor. But who knew you could roast the seeds? They have all the same health benefits, no doubt, as pumpkin seeds. Three cheers for a multi-tasking food! Oh veggies and pesto sounds to die for! I’ll have to try that soon. Don’t take this weird but…I LOVE YOU!!! I bought a spaghetti squash a few days ago and thought “now what? ?” It’s been taunting me ever since. Come here little squash…prepare to meet your tasty doom! hah right back at ya! 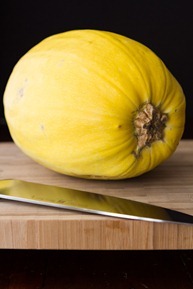 I can relate to having squash sit on the counter for a long time…hope you enjoy it! I can’t wait to try this! I love different ways to get my avocado fix! This is my favorite squash! Did you know you can microwave it too? Super fast and easy. You guys got a big one! Ours are still teeny this early in the season. I love spaghetti squash even if it is kind of strange :) I will sometimes mix half pasta and half spaghetti squash together for a few more carbs. I never thought of using avocado sauce on it though. Thanks for the great recipe! I am also obsessed with The MIndy Project after one show! So much obsessed that I watched it twice this week! Isn’t it great? Threw me by surprise! I heard great reviews about it, so Im glad I watched. I LOVE spaghetti squash. I can eat a whole one myself and have to pack away some leftovers as soon as it comes out of the oven! I love to eat it with chicken parm and roasted tomatoes. Strangely, I also top it with taco meat instead of using a tortilla. And roasting the seeds is a must! I love how creative you are with all your recipes. Avocado is one of my favorite “must have” food, and I’m glad I have another recipe to try with this. I came across your avocado pasta a few months ago and absolutely loved it!! I would of never thought of squash as an alternative to the noodles. Brilliant! The idea of using the avocado sauce is wonderful. Usually I go with the marinara + seasonings + a cheese of some sort. I need to get better about using the seeds for something as I typically just toss them. Ah, Fall shows, don’t remind me! :) We cancelled our cable! I forgot to mention that I added about a tablespoon of nutritional yeast to the avocado sauce – gave it a nice little cheesy tang. This post is perfect timing! I have a spaghetti squash sitting in my fridge right now and I wasn’t sure what I should do with it! Now I’m looking forward to enjoying it. I love your creamy avocado pasta sauce on everything from salads to eggs!! Will definitely have to give it a try on spaghetti squash next time!! I am definitely putting spaghetti squash on my shopping list. I’ve had it before but haven’t been *that* impressed. I’ll have to try it with your avocado sauce though! About fall TV shows, this is my first year actually watching them! I’ve caught up via hulu and now I’m addicted to Parenthood (my fav) and Modern Family. I’m way too excited for Downton Abby to start again! I’ve heard good things about all of those shows, but have yet to watch any. Goodluck with your next squash attempt! 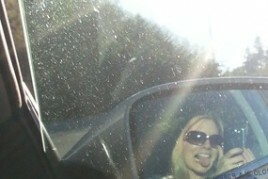 Mine favorite way Is the one I have up in my blog!! How awesome is the Mindy project?? Gonna miss Mindy Kaling’s “Kelly Kapoor” character on the Office but they’re wrapping up their series anyway. Glad she has her own show! Agree – she is so funny on the office. Now that I see her on her own show though, she really shines. The office is holding its own even without Steve. We still watch it every week. This week’s episode was quite funny! 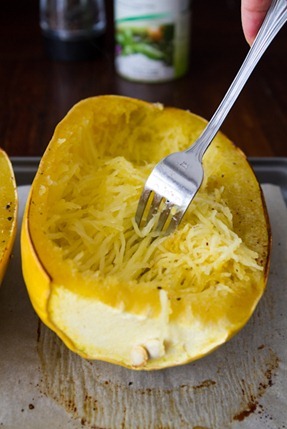 spaghetti squash is one of my favorites. this looks so good! love! I don’t have a ton of time to watch TV but I did really love the first episode of Go On. Also, I’m just barely getting into Parenthood & love it (but am watching the 1st season on Netflix to catch up!). 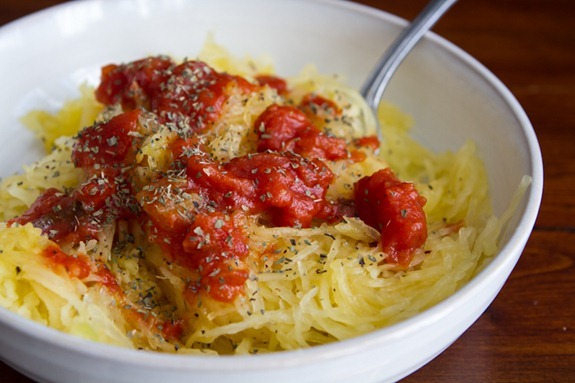 Love spaghetti squash–it’s a great alternative for us gluten intolerant folks. I have been meaning to try that creamy avocado sauce FOR-E-VER. must try this weekend. Must see fall shows? I am loving the return of Up All Night. And Modern Family, of course. And anxiously awaiting American Horror Story next month! Modern Family: we kept missing it last year. It’s hilarious and we have made sure not to miss it again and again this year = tv set to record series. Thanks for the tutorial!! I always steam my spaghetti squash, but it’s really easy to make it too mushy that way. I’ll try roasting next time! You have me craving spaghetti for breakfast now! What a gorgeous squash and thanks for the tutorial. 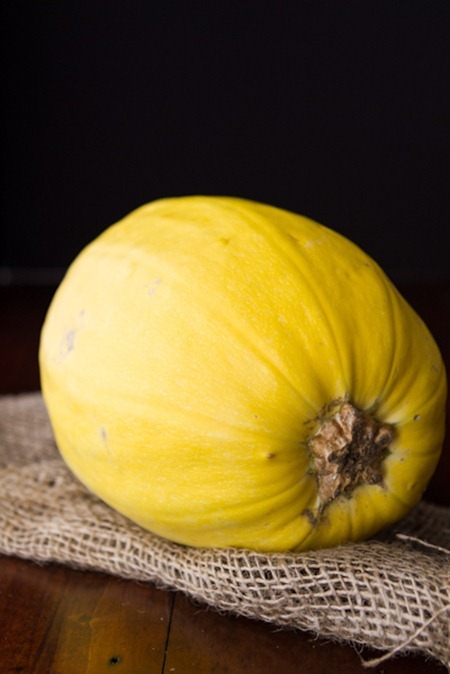 Love the pics…the black background and vibrant yellow squash. They just Pop! 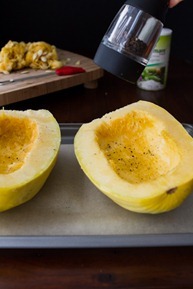 I love spaghetti squash and was planning to make some this weekend…but it never even occurred to me to roast the seeds! Do they taste similar to roasted pumpkin seeds? I assume I can roast them using the same method as in your pumpkin seed post from the other day? It has been ages since I’ve made your creamy avocado sauce so now I’m thinking I need to change that. 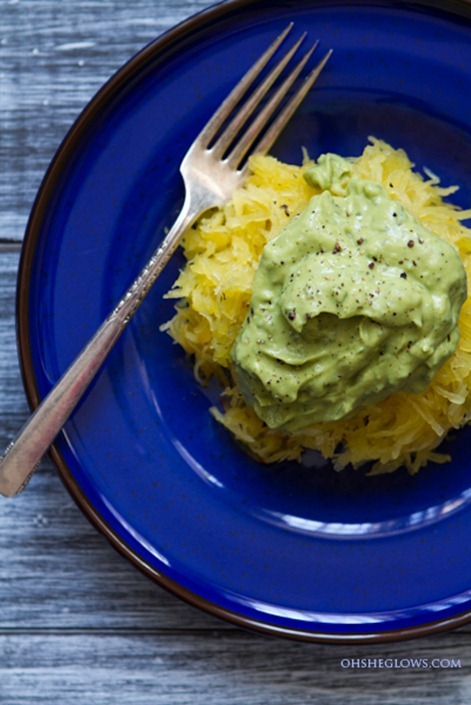 I’ve never been a huge fan of pasta so spaghetti squash is a perfect alternative for me. Thanks for the great recipe Angela! 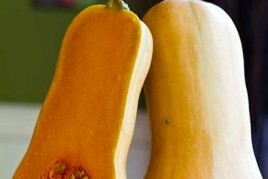 You’re killing me with these squash recipes- in the best way possible of course! :P My squash cravings are at an all time high, yet I have none! Must.rectify.asap. I’ve still somehow never tried spaghetti squash and bought a big, beautiful one a couple days ago!! 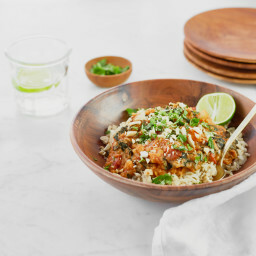 Your recipe came at the perfect time–I’ll be making this tonight! Thanks for posting! I ADORE spaghetti squash! Never tried the avo/squash combo, however…will have to add this to my must-try for fall list! A couple weeks ago, I made spaghetti squash pad thai. Sooooooo yummy! And way more filling than when I made it with plain spaghetti or rice noodles. Oooh, sadly I can’t do spaghetti squash anymore (bad encounter with food poisoning) but I have tried your Avocado Sauce and it is KILLER! I added it to a pasta salad last weekend and people loved it! This post has excellent timing because I made this very dish just last night, and it was my first time playing with spaghetti squash, too! Instead of creamy avocado sauce, though, I used chunks of avocado with a bit of parmesan, and an egg sunny-side up! I used lemon and pepper to season the spaghetti squash. This might be my new country food. BTW, I’ve been reading your blog for six months and I love it! When I’m tired I tend to hop on Google Reader, and your entries always make me want to get up and take on the world again. I went 25 years without spaghetti squash too–had it for the first time this week, and I’m pretty sure I’m in love. Gotta try it with some avocado sauce now! Oh my god, this is *exactly* what I ate last night [with the avocado sauce!] And it was outstanding. We watched the season premiere of Modern Family and Grey’s Anatomy this week- both of which are looking like good seasons! I simply cannot get enough squash!!! This was so good! I just made it tonight. I’ve never made squash before but your pictures made it much easier. I used a little Cajun seasoning on mine. Big hit with everyone; especially my dad which is very surprising because usally if it isn’t meaty or salthered in salt and/or butter he doesn’t like it. So I will be making this a lot now; thanks for the recipie! Hey Karen, that is great to hear! Thanks for letting me know. what a helpful post!! i LOVE spaghetti squash! yum! mmm I love spaghetti squash. Definitely want to try this sauce! Yippeee I just bought one of these yesterday!! I can’t wait to roast it tomorrow. Must say, I LOVE your pink scoop! I don’t eat a whole lot of ice cream but would totally buy it for scooping out squash guts lol! :) Have a great weekend Ange! 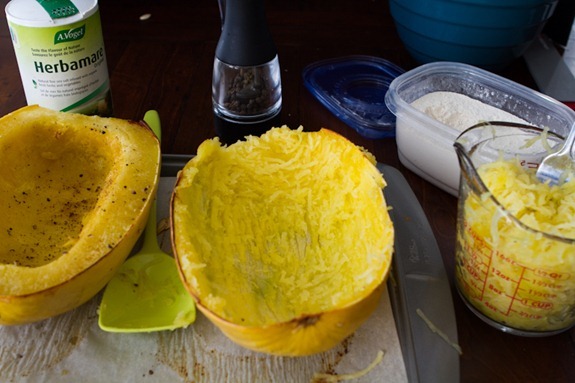 I LOVE spaghetti squash…usually with veggies, olive oil, and seasoning. I am super excited about a lot of the shows coming back. I must admit that I still watch Grey’s and I have been digging Major Crimes too. I love squash! I have summer squash or zucchini nearly every night!now that its turning colder will do more winte squash nd spaghetti is one of my faves with marinera, mushrooms, spinach and peppers. Why have I never thought of slicing the stem part off and then cutting it lengthwise standing up like that? That looks a million times easier than my method of trying to saw through it on its side! Thank you for that tip! I like using spaghetti squash in this amazing casserole recipe from my aunt with tomatoes, onion, carrots, red pepper, cheese, etc! I make my husband pasta (penne because he despises spaghetti noodles, haha) and I make myself spaghetti squash. I cook up a huge pot of tomato sauce with veggies and usually add tofu or chickpeas to mine, and chicken to his. Easy and healthy! 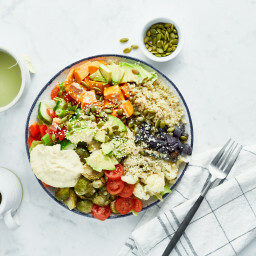 Wow, this really looks healthy and delicious!!! We have to try it here in Europe. Can’t wait for your cookbook to come out! I love your creamy avocado sauce, we have it nearly every week, it looks amazing with the spaghetti squash, will be trying it very soon! Yeyyyy this is the healthiest spaghetti i’ve ever seen :) Cannot wait to try! 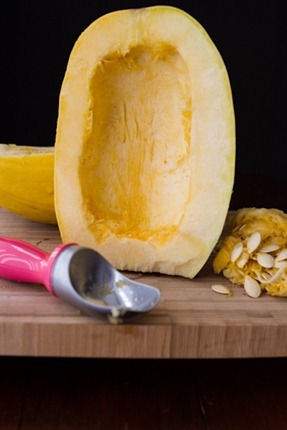 Adore….Adore…Adore the squash. Grew up with that stuff in the garden, and wish that I had NEVER had flour pasta. That stuff is SO much better! i really loved the Mindy Project too. my other fall tv fave is Scandal. the chemistry between the President and the main character, Olivia Pope, is off the charts. We tried the squash last night and it looked just like the picture and tasted better than I had thought it would. Looked it up on CalorieKing and was surprised to read 19 calories for half a cup! So my 2 cups was still an amazing calorie bargain. Thanks for the great tip! I would have never thought of making an avocado sauce. But, why not? Sounds perfectly delicious. It’s a little early for lunch here but I show no shame. This dish is awesome. I only tweaked it a little. I halved the recipe and only added a leaf or two of basil and it’s just enough. I also added in some chopped avocado and a dash of hot pepper flakes, because well… why not? I love speghetti squash! I usually steam it and then throw some parm cheese on top with a dash of salt n pepper. It’s a great side for along Salmon. My boyfriend can’t stand the texture of it. Strange?! I get the tomato texture thing but not the speghetti squash! He’s missing out. I tried spaghetti squash “spaghetti” for the first time a few weeks ago, and I was floored by how amazing it was! It was absolutely delicious and now I would soooo much rather have that than regular spaghetti any day! Hey Angela! This looks delish. I’m planning on making it this weekend for Thanksgiving (I know, not a traditional choice but it will be delicious anyways :) ). Do you think it’s substantial enough on its own, or should I pair it with beans or something? Any pairing suggestions? Well, shoot. I just roasted a spaghetti squash last weekend and threw out the seeds. Bummer. Your roasted seeds look tasty. I too am a spaghetti squash novice but going gluten free for a thyroid problem is making me stretch my food boundaries. I got one at the Farmer’s market and when I got around to trying it a few weeks later, I cut it open and found the seeds were sprouted. I went ahead and cooked it but it was very bitter. Anyone else had that experience? I’m not giving up–got another one and will give it a try with your method and avacodo sauce–yum! I know I will probably love it once I figure out how to buy a good one! No time for TV but always make time for your blog! 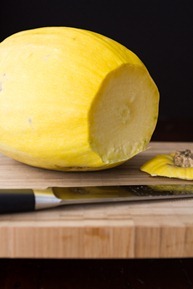 hm…had some spaghetti squash recently at a restraunt…it was bland, even tasteless…and put me off something fierce. I guess I could try it at home here with your encouraging recipes and ideas…worth a shot! Thanks for the encouragement! Love the avocado sauce idea! One trick I’ve used for preparing spaghetti squash is to use my (electric) pressure cooker: 1-2 cups of water in the bottom of it, squash placed whole on a rack inside the cooker, and then 8-10 minutes on High (depending upon squash size). Let the pressure diminish naturally, and you’re set! I would like to subscribe to you blog. Hi Elaine, You can find subscription in the top right hand side of the blog (see all the buttons?) you can subscribe by email or RSS. Hope this helps!! Greetings from an American currently residing in Austria! The other day I stumbled across a spaghetti squash here at the grocery store – had never seen them being sold in this part of the world before! I was very excited, bought it, and am now scouring the internet for recipes on what exactly to do with it. Have never had one before – much less made anything with it – so I’m excited to try something new. :-) I very much appreciated the step-by-step instructions on how to roast it, including photos!! I think I’ve got it now…. I may do the avocado sauce or just some pesto – haven’t decided yet. But thank you for your blog post! Hey Nadine, so glad the photos are helpful for you! Let me know how you like it. Thanks so much for this tutorial. I didn’t realize that cooking spaghetti squash was so easy…I whipped up some marina sauce with fresh veggies as the topping. Delicious! I’m wondering how you two did manage a 5 pound squash xD We made spaghetti squash with tomato sauce yesterday – it weighed 2.9 pounds and we had a hard time finishing it. With some sauce this was perfect! I think the squash itself didn’t have that much flavor, but as a sauce base I guess it is not meant to have a strong own flavor. For me, it is quite different from other squash or pumpkin. I think it tastes more like a zucchini. Thanks for the recipe! 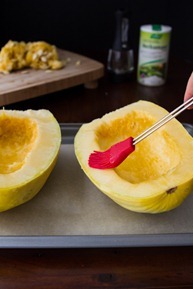 without the pictures I would never have known what to do with a spaghetti squash. It’s a shame they don’t hand out recipes/step-by-step-directions in the shops so that people see that it is not that hard to cook something from fresh components! i do love spaghetti squash! some time ago i introduced my dad, 88, to it with no complaints! i freeze leftover squash in individual portions for later use. i guinea pigged the avocado sauce tonight (with quinoa elbows i had on hand instead) for dinner with dad. his comment was to serve it as a cold salad…he is so smart!! we both pronounced the recipe a keeper!! i sliced a lovely red bell pepper along the side for a kick of color and a tenderloin of grilled chicken for him! btw…i do not own a food processor so used my small electric handi-chopper due to the small amount of ingredients. it worked like a charm!! this recipe is being passed to my neighbors!! thank you! dessert was (avocado)key lime pudding from purely twins. 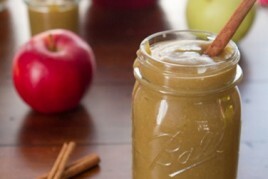 added extra stevia..still very tart..but oh, so good for you! would be good served in individual tarts! this is the start of avocado season in florida so many more recipes to try!!! Love this blog, but this is my first recipe-making adventure! I was in a rush so the avocado sauce was made with Wholly Guacamole with lemon and grape seed oil…I have a long time obsession with Spaghetti Squash, so this was right up my alley. Fresh, filling, and extremely satisfying, I can’t wait to test drive more recipes :) Thanks, Angela! 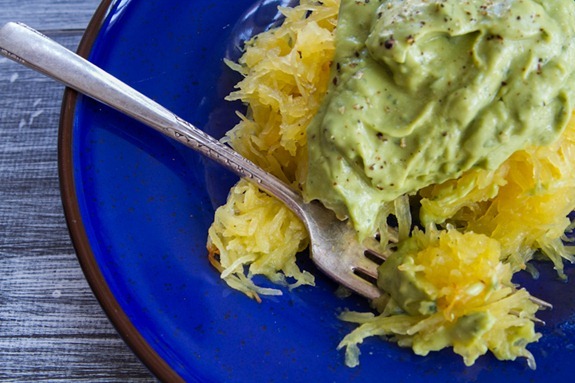 Oh my gosh, I just made the Creamy Avocado Sauce on Spaghetti Squash–so so good! It is my new favorite. Thanks for sharing this recipe. I just made this tonight and I have to tell you it’s one of the best things I’ve made!!! I suffer from Ulcerative Colitis and coming to your blog has been SUCH a cooking inspiration to me. I decided about a month ago to completely over-hall my diet and it includes gluten-free, dairy free, and sugar free! Today was not my best day but I ate this dish and my stomach actually tolerated it completely! Finding your website has been a pure blessing! Thank you SO much for sharing all of these good recipes and food ideas! Amazing!!!! Thank you Julia, that means so much to me! I am determined to like spaghetti squash, or at least try it again soon. I have terrible childhood associations with it, mostly because it was set in front of me with the stretched truth of “it tastes just like pasta.” I love fall produce so much, and I really want to add this to my squash list! I’m late to the game and haven’t read all 100 comments, so I don’t know if anyone mentioned this yet, but if you cut the squash in half horizontally rather than vertically, the spaghetti pieces are much longer. I know some people complain about spaghetti squash pieces being too short to twirl and whatnot, so that’s an easy fix! It also makes a cute serving dish in itself. My husband and I like to cook this on the grill. We just put a little olive oil or butter on it and sprinkle with garlic powder cook on indirect heat for about 40 minutes. It is a great sidedish with chicken or steak even fish!!! I have yet to try this sauce with the squash, although it looks delicious and will be in the very near future, i have had it a few times with flax and whole wheat spaghetti and it’s amazing! Another winner from Angela! My 15-yr-old loved this. An easy, healthy, vegan meal. ok, I never comment on blogs, but I just have to be effusive and wax poetic about your recipes! I have been vegetarian for a few months now and it’s going well, but trying to slowly transition towards less and less animal based recipes. I discovered your blog a few weeks back and I am in love! I just made this spaghetti squash with avocado sauce and I am devouring it with a big smile. Thank you for changing the way I see food! Thank you Ann, that is the best compliment I could ever receive. I hope you enjoy many more recipes to come! although I like your site and have used several of your recipes, I no longer youe them because of the difficulty in priting them out. Case in point was recipe for spaghetti squash. I tried to print it out 3 times but was only able to print page 1; the rest was advertisements. To use the recipe I have to go to the computer which is very inconvient. Oh, yes I clicked the button that asked if I wanted to print the recipe–still unable to print out. Sorry, but just not worth it. Hi George, Did you say there are ads printing out on the recipes? That is strange. I just did a couple tests and that didn’t happen to me. Recipage just added an ad to their pages but it shouldn’t be printing out. If you continue to experience problems, please contact the recipage team at recipage[at]gmail[dot]com Thanks! Is cooked spaghetti squash supposed to be crunchy when ready. I have cooked mine for about 50min scooped out all the stringy goodness. But it is still crunchy. Holy S***. I made this sauce and topped it over steamed broccoli, whole wheat pasta and pan seared red snapper….It was so easy, so quick, and probably one of the best things I have ever had. Ever. ever. thank you thank you thank you!! Can’t believe i haven’t thought of this myself. Loved it!!! Sharing with all my friends. I’m so happy to hear that Skylar! My name is Kelly Sepich and I am the online marketing coordinator for Bauman College. We have written a delicious spaghetti for our Spring catalog and are in need of a beautiful photo. 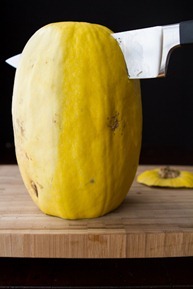 I stumbled across your blog and am in love with your spaghetti squash pictures. When you have a moment, would you let me know if we could use your pictures with of course credit to your and a link back to your website? I confess: I don’t eat very healthily. At all. I’m officially working on it. Homemade kale chips instead of potato chips, more water, less coffee. But I was still very skeptical when it came to the avocado pasta sauce. I was wrong. So, so wrong. Ah-mazing! Debating-licking-the-blade-of-the-food-processor-so-it-doesn’t-go-to-waste amazing! I spiralized some zucchini for my pasta because I’m big on twirling and topped it with a dollop of this garlic-y, decadent goodness. Holy cow! I never thought I could be vegan, but by degrees you’re changing my mind. Wait…is the vegetable I.e. the squash itself actuslly called spaghetti squash or is it just a regular squash plant thing? The link above won’t seem to allow me to open the page for the creamy avocado sauce that you played around with for this recipe. Couple you email? Thanks a million for all your delicious recipes! Hi Lisa, It should be working now, sorry about that! Recipage had some issues last week. If I wanted a thicker noodle, can I noodle the squash first through a spiralizer, then roast the noodles? Ahhh I can’t wait to try it for the first time! I have 3 vines growing in my garden. The first spaghetti squash I will eat will be grown by me :) From what I’ve read I will have around 15 of them from 3 plants! LOVED this recipe. only thing i changed was adding a tablespoon of agave nectar and a tablespoon of vegenaise to the avocado sauce (mostly because i added too much garlic, but the vegenaise and agave really popped the flavor) and topped it with roasted sesame seeds. Ill be cooking a lot more squash now! I made this last night and it was easy and delis – a big hit!! Thank you for another great recipe. Next post: Victoria, British Columbia –Trip Highlights & Photography!